The Darent is a chalk stream, not quite big enough to be classed as a river, running north off the greensand ridge beyond Westerham past the Roman villa at Lullingstone, on through Eynsford, past a former paper mill at South Darenth and onto Dartford, where it navigates the park and then the industrial end and eventually leaves the town behind and, relabelled as Dartford Creek, winds through wide grazing marshes and picks up the River Cray to finally issue into the Thames. At its mouth is runs beneath an ugly, concrete blockhouse that is the Dartford Creek flood barrier, installed in 1981 as part of the wider flood defences along the Thames. On the west bank it is Kent and east bank, London. This is one of of only 160 chalk streams in the UK and 210 in the world; sadly its rarity is in many sections not reflected by its condition. The clay shoot club is busy at the end of Joyce lane and the sounds of shotguns puncture the mild air. Fieldfares and a handful of redwings scatter from one patch of berried hawthorns and blackthorns to reunite on another; starlings wheel over the pastures. The waders and gulls gather like a medieval army on the mudflats at the estuary mouth. Teal and wigeon forage in small groups on the edge of the mud-banked tidal river and fly upstream on approach. 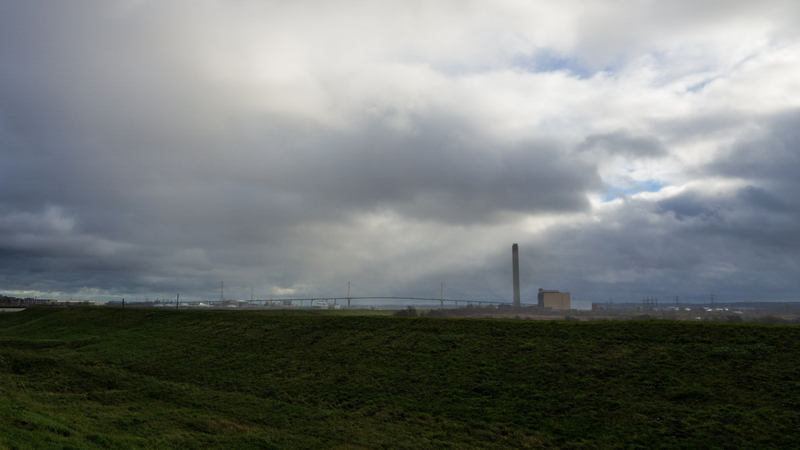 The rain sweeps in short bursts on the brisk wind from the west and the slices of sunlight pick out the pylons and rows of terraced houses on the north shore of the Thames near Rainham marshes. The flat landscape of grazing marshes, thorn bushes, reed beds and narrow ditches is shot by a power station stack, sewage works, flood barrier and hotpotch of loud and dirty industries best placed a long way from anywhere. The Long Reach of the Thames is only fit for dirty British coasters. A lovely post. I enjoyed the link on chalk streams too.